Here are some answers to our most frequently asked questions. We hope you find this a helpful resource, but don't hesitate to Contact Us if you need more information! Q. What makes a fire pump different from other kinds of pumps? A. 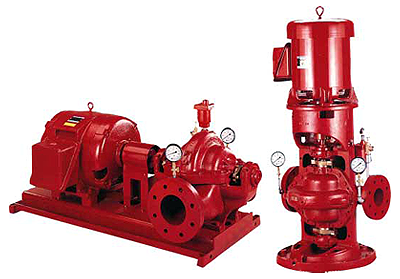 Although Aurora fire pumps are nearly identical in appearance to their 410 and 420 horizontal split-case pumps, they differ in a few subtle ways that make them more suitable for use as Listed Fire Pumps. First, they meet the stringent requirements of NFPA Pamphlet 20, Underwriters Laboratories and Factory Mutual Research Corporation for reliability and unfailing service under the most difficult and demanding circumstances. This fact alone should speak well for Aurora's product quality and premium design features. Fire pumps are required to produce specific flow rates (GPM) and pressures of 40 PSI or greater. Further, the above mentioned agencies advise that the pumps should produce at least 65% of that pressure at 150% of the rated flow -- and all the while operating at a 15 foot lift condition. The performance curves must be such that the shut-off head, or "churn," is from 101% to 140% of the rated head, depending upon the agency's definition of the term. Aurora's fire pumps are not offered for fire pump service unless they meet all agencies' requirements. Beyond performance characteristics, Aurora fire pumps are carefully scrutinized by both U.L. and F.M. for reliability and long life through analysis of their design and construction. Casing integrity, for example, must be suitable to withstand a hydrostatic test of three times the maximum operating pressure without bursting! Aurora's compact and well-engineered design allows us to satisfy this specification with many of our 410 and 420 models. Engineering calculations for bearing life, bolt stress, shaft deflection, and shear stress must also be submitted to U.L. and F.M. and must fall within conservative limits to ensure utmost reliability. Again, the superior design of Aurora's split-case line comes through with flying colors. Finally, after all the preliminary requirements have been met, the pump is ready for final certification testing to be witnessed by representatives from U.L. and F.M. Performance tests will require that several impeller diameters will be demonstrated satisfactorily, including the minimum and maximum, and several in between. Q. What is the typical lead time for a fire pump? A. 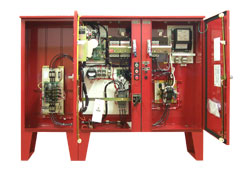 The control panels can ship out in a week or two if desired, but often are held back to ship with the fire pumps. Typical lead times run 5-8 weeks from release of an order; however, Aurora has a Red Hot Quick Ship program for their fire pumps which can produce fire pumps in three, two, or sometimes even one week! Call us for details. Q. Is there a market for used fire pumps? A. No. Due to the liability encountered in fire pump installations, there are not many people who would be willing to risk putting used equipment in a new system. Q. What is the easiest way of determining pump rotation? A. For a horizontal split-case fire pump, if you are sitting on the motor facing the fire pump, from this vantage point a pump is right-hand, or clock-wise, if the suction is coming from the right and the discharge is heading toward the left. The opposite is true for left-handed, or counter-clockwise rotation. The key is the vantage point when discussing this topic. Make sure both parties are viewing the pump casing from the same side. Q. Can I get a single phase fire pump? A. Yes, provided that the motor HP does not exceed 15, and the job site voltage is 230 volt. The motors on these units are not currently listed for fire protection, but the control panels on the fire pumps are. Cost increases are moderate. Q. How are engines and motors sized for fire pumps? A. 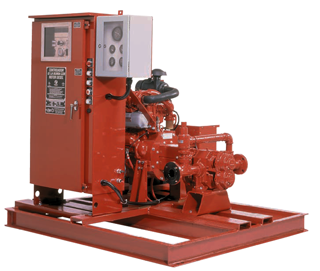 Motors and engines supplied with Aurora fire pumps are sized according to U.L., F.M. and NFPA 20 (2013), and are designed to operate on any point of the fire pump curve without exceeding the motor nameplate service factor, or engine size. Do not be fooled into thinking that the motors are sized only to 150% of nameplate capacity. It is not uncommon for fire pumps to operate well beyond 150% of rated capacity (for example, if there is an open hydrant or broken pipe downstream). For more specifics, please refer to NFPA 20 (2013) paragraph 4.7.6, UL-448 paragraph 24.8, and Factory Mutual's Approval Standard for Split Case Fire Pumps, Class 1311, paragraph 4.1.2. All motors and engines supplied with Aurora fire pumps are sized to the true intent of NFPA 20, U.L. , and Factory Mutual. Since fire pump motors are not expected to be running continuously, they are often sized to take advantage of a 1.15 motor service factor. So unlike domestic water or HVAC pump applications, a fire pump motor is not always sized “non-overloading” across the curve. As long as you do not exceed the motor 1.15 service factor, it is allowed. An exception to this is when a variable speed inverter duty electric motor is used. Q. Can I use a flow meter loop as a substitute for a test header? A. A flow meter loop is often practical where flowing excessive water through standard U.L. Playpipe nozzles are inconvenient; however, when using a closed flow meter loop around a fire pump, you may be testing the pumps hydraulic performance, but you are NOT testing the water supply, which is a critical component of the fire pump system. If there is an obstruction to the water supply, this will not be evident with a flow meter loop, but will certainly be exposed by testing a fire pump with hoses and Playpipes. On an initial start-up of a fire pump system, we always insist on flowing water through the system to ensure the integrity of the entire system. If a flow meter loop is returned back to the water supply -- such as an above-ground water tank -- then under that arrangement you will be able to test both the fire pump and the water supply. Just make sure that your flow meter is properly calibrated. Q. I heard you no longer need a relief valve on diesel fire pumps. Is that true? A. Not in all cases! By 'relief valve', we are assuming you mean "main relief valve" for the system. The answer to this question depends on the specific pump being used, as well as the specific static suction pressure at the intended installation. NFPA 20 allows for the overspeed shutdown on diesel-driven fire pumps to protect the system in event of a "runaway engine"; however, the overspeed shutdown will operate on a 10% overspeed condition. Since pressure delivered by a centrifugal fire pump is a square of the impeller speed, you need to take the product of the pump's churn pressure multiplied by 1.21, and add this result to the highest expected suction pressure at the fire pump. If the final result exceeds the pressure rating of your fittings, then you need a main relief valve. Remember to refer to the individual pump's performance curve, which varies by manufacturer and model number. This is in accordance with NFPA 20; however, it is our recommendation to use 1.44 instead of 1.21 in the equation, since many engine overspeed safety devices operate at 120% of rated speed, not just 110%. When in doubt, use a main relief valve. As for electric motor-driven fire pumps, NFPA is moving away from using main relief valves to protect system fittings (refer to NFPA 20 (2013) 4.18.1.2, and 4.18.1.3). This means that you need to know the churn pressures on your fire pumps AND the maximum expected static suction pressure of your installation. Aurora has several "flat" or low churn models available. Call for details. Q. Do I need to worry about NPSH in fire pump applications? A. Rarely. NPSH (net positive suction head) is an important consideration in industrial applications, such as boiler feed or hot water pumps. With fire pumps, however, you are dealing with cold water, which uses all of atmospheric pressure to your advantage. Fire pumps need a "flooded suction," where the water arrives to the pump impeller through gravity. You need this to guarantee a pump prime 100% of the time, so that when you have a fire, your pump operates! It is certainly possible to install a fire pump with a foot valve or some artificial means for priming, but there is no way to guarantee 100% that the pump will function properly when called on to operate. In many split-case double suction pumps, it only takes approximately 3% of air in the pump casing to render the pump inoperable. For that reason, you will not find a fire pump manufacturer willing to risk selling a fire pump for any installation that does not guarantee a "flooded suction" to the fire pump at all times. Q. When will you answer more questions on this FAQ page? A. We will add them as issues arise, but feel free to call us with your questions! Q. Can I supply the electrical feed to the jockey pump controller from the fire pump controller circuit breaker? A. No. This is a direct violation of NFPA 20 (2013) 9.7.paragraph (6), and 10.3.4.5.1.